THE BOWL SAT on the piano in the center of the house. My mother had placed a large fluted glass vase in the center, large enough to hold entire branches, which was important, especially in spring, when her bowl reflected the unfolding of the season: silver pussywillows in March, followed by a pink froth of apple blossoms in May, then ivory dogwood from the hedgerows and finally that season’s crescendo, an enormous display of tulip magnolias cut from the large tree by the front pasture. In summer, the bowl held whatever might be blooming in the garden, or meadow flowers. If nothing was blooming, it sat empty. In late fall, she filled it with spires of oak leaves. Once a friend brought my mother a magnificent bouquet of yellow roses, but my mother put them in another room. The bowl, her pride and the seasonal centerpiece of the house, held only what we cut and gathered from the land around us. I knew Christmas was coming for real when it was time for our annual expedition into the woods to search for red berries from the swamp. Like most things in a large family, getting out of the house involved a great deal of bustle, excitement, and hullabaloo — the finding of socks and boots, hats and lost mittens, the calling of the dogs, does someone have the clippers? — then off we’d go. My mother had a way of making even a mundane walk out through our farm into a grand adventure. Cutting the wild holly, beaming red from the center of a woodland swamp, always involved a precarious balancing on mounds of tuft grass. Of course we fell through the ice and into the freezing water and our boots leaked; by the time we were back at the house with our bounty — not just boughs of red berries for the bowl, but branches of hemlock with tiny pinecones still attached for decorating the mantles — my feet were so cold they burned. 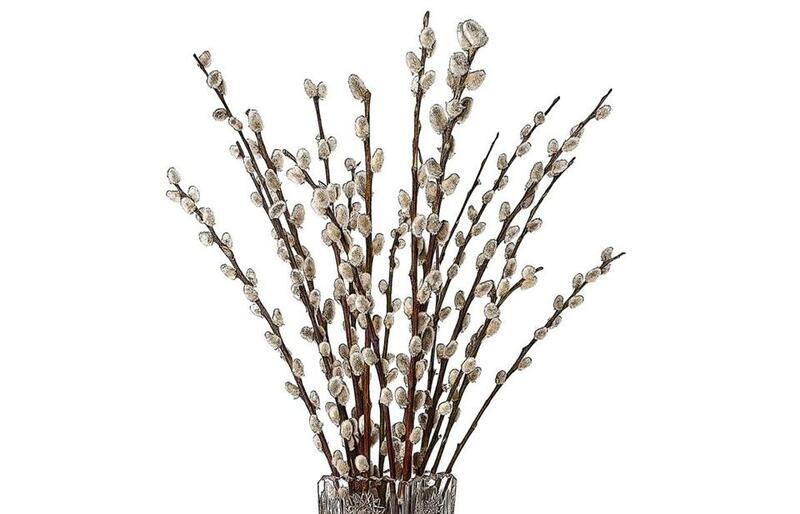 I knew it was spring when we headed out, usually through the bitter March wind, to hunt for silver pussywillow catkins. For these we had to walk to the back pond, and the swampy area just beyond it, looking along the way for signs of green by the drainage ditch where later we’d come back to look for gooey brains of frog egg casings. Did my mother talk about the books she was reading to us while we walked? I can’t remember, but as soon as we entered the swamp, pushing through brambles, I was Uncas, the all-knowing Mohican forest guide, carefully leading the white settlers to safety in “The Last of the Mohicans.” Then on the way back, looking for that other swamp herald of early spring — pokes of skunk cabbage — I was the boy in “Elmer and the Dragon,” always on the hunt for skunk cabbage to feed his baby dragon. When I was younger, I thought my mother’s insistence of never buying cut flowers was another facet of her inherent thrift. A child in the Depression, a teenager at the outbreak of World War II, a professor’s daughter, my mother was generous, but rarely bought luxuries. It wasn’t until she died that I realized that her bowl and our seasonal walks out through the farm were her way of teaching us how to have a connection to the natural world around us, and an awareness of the seasons, our planet’s movement, and ours, through time. Not everyone grows up on a farm, or has the privilege of walking out of their house into open land. I no longer have the luxury of living on our farm. But even in the city, one can find nature and witness the changing of the seasons. In his groundbreaking essay, “The Trouble with Wilderness,” environmental historian William Cronon called for an urgent update to the environmental movement, pointing out that the 20th century emphasis upon saving “wilderness” had been unproductive because it posits us outside of nature, rather than within nature where we actually live — and in doing so, gives us permission to ignore and fail to take responsibility for how we use environments to live. We cannot save nature unless we find ways to connect with it. Birds this morning. A whole new braid of sound. It’s the beginning of spring, the vernal equinox. It’s been a year since my mother died, and I’m nowhere near ready to let her go. I walk down our road to a neighbor’s farm, looking for glimmers of silver pussywillows in the swamp, the way my mother taught me. Leila Philip is a professor in the English department at the College of the Holy Cross. Her column appears regularly in the Globe. Follow her on Twitter @theleilaphilip.